Please use the list below to navigate through the topics to learn about how teeth whitening works, the Laser + Holistic Dental Whitening Protocol and the differences to standard bleaching techniques. Your teeth are made up of a hard enamel outer surface, and the softer dentine tissue underneath the enamel. These dental tissues are the hardest in your body and protect the soft pulp tissue inside a chamber of the tooth. 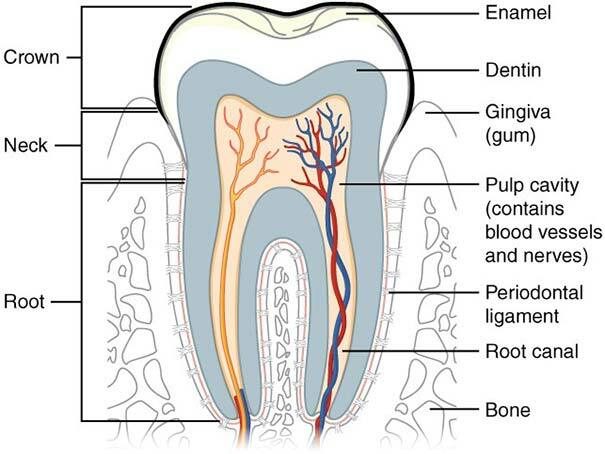 The pulp tissue contains the blood and nerve supply of the the tooth as well as lymphatic vessels. Although enamel is the hardest substance in the body, it is porous – meaning it becomes susceptible to staining over time from food, beverages and lifestyle factors like smoking. The original inherent tooth colour is influenced in utero by genetics and mineralisation factors. After eruption of the teeth into the mouth, extrinsic stains absorb into the microstructure of the teeth, becoming intrinsic stains, which ultimately adds to the discolouration of a tooth. Teeth whitening works by using a chemical reaction to trigger oxidation of the absorbed staining compounds, known as chromophores. The reaction breaks down the chromophores inside the dentinal tubules and by doing so – whitens the teeth. While you are considering a whitening treatment it is important not to have unrealistic expectations. Most perfectly white teeth in marketing images are either photoshopped or are crowns or veneers – not natural teeth. The degree of the whitening effect is difficult to predict as it is dependent on mineralisation of the teeth which is determined by genetics and development during childhood. Some research has found that a small percentage of people will not respond to whitening treatment. However, our clinical experience has found that everyone responds to the Laser + Holistic Dental Whitening Protocol – even antibiotic damaged teeth from tetracycline – although the response may be at a lesser degree than normal teeth.To learn about common bleaching techniques and the advantages of the Laser + Holistic Dental Whitening Protocol, please continue through the sections below. Laser + Holistic Dental’s teeth whitening protocol has been developed through a process of intense scrutiny to ensure both effectiveness and safety. The result is a combination of professional in-chair laser whitening with a take home whitening kit for long term results. Our advanced lasers can emit different wavelengths of light and for teeth whitening we use the Er:YAG wavelength. The Er:YAG laser wavelength has an absorption peak in water, which is the major component of dental bleaching gels. This means the laser beam is fully absorbed in the gel and does not penetrate to the hard tissue or the pulp, as is the case with other laser-assisted whitening methods that use diode lasers. The energy emitted from a diode laser is deeply penetrated and passes through the bleaching gel and becomes absorbed by the tooth. This can create an undesirable thermal shock on the whole tooth. By using this specific wavelength Laser + Holistic Dental avoids overheating the hard tissue and pulp. This minimises risks of potential irritation of the pulpal tissue which often manifests later as severe reactions to hot or cold sensations, known as a transient pulpitis often experienced by standard bleaching systems. At Laser + Holistic Dental our preferred gels have no additional chemical stabilisers, preservatives or additives like sodium or stannous fluoride, potassium nitrate, HEMA or benzoalkonium chloride. The gel is formulated with a 100% aqueous base and a neutral pH. This ensures a rapid release of whitening factors and lower osmolarity – reducing the risk of tooth sensitivity. The gel for in-chair laser whitening is a hydrogen peroxide solution and for home use it is carbamide peroxide. Carbamide peroxide naturally breaks down into urea and peroxide which are natural metabolites – and the urea helps to alkalize the tooth and saliva preventing mineral loss from the enamel. Hydrogen peroxide breaks down into oxygen and water. Our preferred gel is also considered active thanks to strict manufacturing and storage criteria – maintaining the integrity and effectiveness of the ingredients. In most common bleaching products the active ingredients have already deteriorated by the time they reach you for use – reducing the gel’s effectiveness and increasing its acidity. Once the in-office whitening procedure is completed, we will also provide you with a home whitening kit to keep your smile spectacular. The kit includes whitening gel, customised trays and very importantly – applications of specially formulated Vitamin C hydrogel and ACP paste (amorphous calcium phosphate) that are to be used during the completion of the home whitening session. When considering starting your whitening treatment please take these recommendations into account. It is always best to commence whitening done within one week of having a professional clean. This allows time for the the gums to heal properly if there was some infection present prior to the hygiene visit. Having all the bacterial calcified deposits, external stains and dental plaque oral biofilm removed will provide a better surface for the laser activated gel to undergo the chemical reaction to create a great whitening effect. Incidentally, a number of clients of Laser + Holistic Dental found it a lot easier to stop smoking after they had their professional hygiene appointment and then whitened their teeth. This helped with their gum health, and in addition it gave them incentive every day to stop smoking cigarettes. The cost benefit alone in not paying for cigarettes more than paid for the whitening treatment. It was a very satisfying and positive reinforcement approach rewarding them for making healthy lifestyle choices. Laser + Holistic Dental also recommends that it is best to have whitening done before any ceramic crowns or veneers are placed, especially in the cosmetic smile zone. This allows for the dentist to select the shade of the ceramic crown to match the newer, whiter shade of the other natural teeth. Once the shade is selected for ceramic crowns or veneers, it can never be changed, so it is always best to stage the sequence of services to whiten your natural teeth first, then have the ceramic crowns and/or veneers made subsequently. Timing is critical in ensuring the best cosmetic outcome. If there is a special event that you want to look your best such as your wedding, then it is wise to start teeth whitening at least one month before the special date. Most people complete the course of whitening within three weeks following the in-office session. Another important health concern that needs to be stated is that Laser + Holistic Dental do not offer whitening services for patients with amalgam fillings. This position is based on research that demonstrated that dental amalgams are not stable in the mouth and there is a greater release of mercury from the application of bleaching agents.2 Laser + Holistic Dental recommends that whitening of your natural teeth should only be done in a mercury free mouth and can occur at any time following the replacement of the last amalgam filling. In recent years, teeth whitening has become a big business with many cheap and potentially unsafe methods becoming available to the public. Many bleaching methods pose the risks of dissolving tooth enamel or exposing soft tissues such as the gums, lips and mouth to high doses of UV radiation. Many bleaching gels add antimicrobial preservatives such as sodium benzoate and/or methyl propylparaben. These preservatives will often accelerate the breakdown of hydrogen peroxide during storage and release transition metals such as iron, copper and magnesium.8 Bleaching gels will often degrade during storage and shipping if not formulated properly and constantly kept cool. As the gels degrade they break down, producing more hydrogen ions – resulting in acidifying the hydrogen peroxide gel. Gels that require the use of additional chemical stabilisers to avoid the need for refrigeration increase the osmolarity of the gels significantly. The stabilisers create an osmotic ‘pull’ on the dentinal tubular fluid inside the teeth – increasing the risks of sensitivity. Incorrect usage or usage of poor quality bleaching gels is likely to increase tooth sensitivity and pain following the bleaching procedure. For further detailed information about teeth whitening please call (03) 9078 0387 or contact us today. Please submit your details below to receive an emailed PDF of the common FAQs relating to Teeth Whitening. 12. The effect of hydrogel and solution of sodium ascorbate on bond strength in bleached enamel. 13. Effects of casein phosphopeptide-amorphous calcium phosphate (CPP-ACP) application on enamel microhardness after bleaching. 14. Effect of CPP-ACP application on flexural strength of bleached enamel and dentin complex. We will call or email you soon with more information about Teeth Whitening.